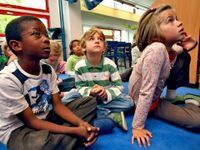 Make mindfulness a part of classroom learning by integrating it into curriculum-themed activities through exercises in breathing, sensory experience, guided imagery, and movement. 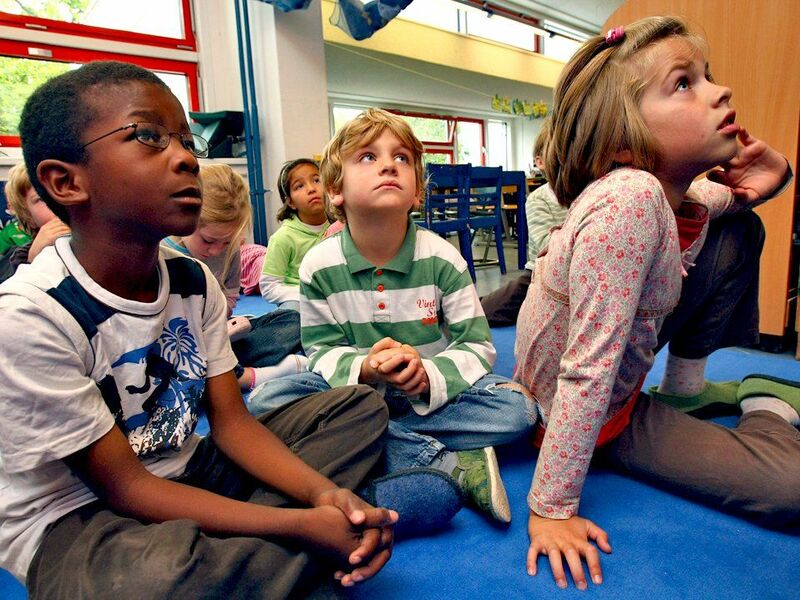 Now more than ever, teaching mindfulness in the classroom is a necessity. Our children are stressed and anxious. Teachers and parents are stressed and anxious, too. Our lives are busy, and we often find our thoughts buzzing over the past or worrying about the future. We need mindfulness because it teaches us to live in the present moment, enjoying and experiencing what’s in front of us. Educators know that children learn best when they are comfortable, safe, and relaxed. Imagine if, along with giving our children the gift of lifelong learning and the tools to become kind and productive adults, we could also give them the gift of mindfulness -- using their breath and mind to lead a happy and healthy life. In turn, teachers will reap the benefits of mindfulness, as well -- we all know that a happy teacher has a happy classroom. Following are four ways to incorporate mindfulness into your curriculum and bring calm to your classroom. When we are stressed or anxious, we often take shallow breaths into our chests. By breathing deeply into your belly, you can use your breath to calm both your body and mind. To practice mindful breathing, place your right hand on your belly and your left hand on your chest, feeling the gentle rise and fall of your breath. Count to three as you inhale, then count to three again as you exhale. Close your eyes, too, if that feels comfortable. Try mindful breathing first by yourself, and then include your students. They can pretend to inflate a balloon in their bellies, or you could use a Hoberman Sphere for a visual representation of the breath. You can return to this simple breathing technique throughout the school day to help with transitions, before test preparation, or during difficult situations. Sensory experiences also help children focus and relax. Try listening to relaxing music or other calming sounds in the classroom. You might also take the children outside to hear the sounds of nature. They could play I Spy or create mind jars. This activity involves putting items with strong, familiar smells (like cinnamon, flowers, cheese, or popcorn) in jars and having the children guess the items by using their sense of smell. To focus them on their sense of touch, ask your children to close their eyes, give each one a cotton ball or sponge, and have them guess what they're holding. Sensory tables covered with containers of water, sand, ice, or thematic props are great. Encourage imaginative play with Play-doh, clay, shaving cream, or Slime. Guided imagery develops children's imaginations. It also helps to integrate learning with prior knowledge. When you start a new topic in your classroom, have your students close their eyes (if that's comfortable) and slowly talk them through a pretend journey. For example, if you're studying the ocean, have them imagine getting into underwater vehicles and cruising through the ocean waters, looking for fish, animals, and plants. End the guided relaxation with a few deep breaths, and then they can draw what they imagined and discuss their ideas as a class. You could take them on pretend journeys into outer space; to the beach, forest, or a deserted island; on a safari or up a volcano -- depending on your curriculum topics. Take your children on journeys through relaxation stories to help them calm down and re-energize. Humans are born to move. Our distant ancestors spent their days running from predators or hunting for food. Movement is a natural part of human life that has become a luxury in modern times. Introducing movement into your classroom allows your students to tap into their natural way of learning. Yoga is a simple strategy for adding movement to your school day. Children can mimic their environment to develop their self-expression and self-confidence. They can practice yoga in their chairs, in the gym, or outside. Again, using poses that correspond with your class topic makes the motion relevant and meaningful for your students. For example, if you're studying animals around the world, you could practice Downward-Facing Dog Pose (to be a sheepdog), Cat Pose (to be a lion), and Extended Child's Pose (to be a turtle). Use yoga pose cards or yoga books to brainstorm yoga pose sequences that your children will love and enjoy. Try picking one mindfulness practice to start for yourself. Then introduce it to your students, adapting the experience to cater to their needs -- even if it’s for only two to five minutes per day during transitions or for brain breaks. You might try introducing a new mindfulness practice every week, every month, or every term, or just choose one idea (mindful breathing, for example) and practice that throughout the year. Plant the seed of mindfulness and meditation right now, and it will stay with your students for their entire lives. In the comments below, please share how you practice mindfulness with your students.